We are sorry for the confusion with discounts for The Wizards. When you get the notification for the first time, it was probably when the bug on Steam's site affected some players and sent them false information about discounts. I believe that the second time you might have simply miss the discount. Our game was on sale for only four days, from Tuesday to Sunday. We are going to discount the game again in less than two weeks so I hope that you will have a chance to finally make a purchase. If you still encounter problems with buying the game on the discount, please let us know and we will find a convenient solution to this issue. 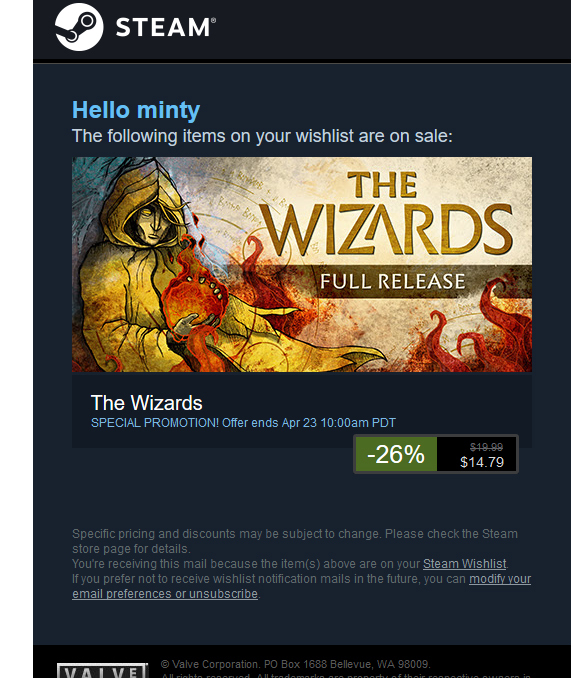 Post Reply: Steam Wizards Sale.